You asked for it, so here it is. The next episode in our series of bone jarring compilation videos that will have you up out of your seat and psyched up like never before. 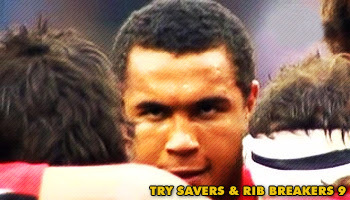 Try Savers & Rib Breakers 9 is upon us and brings you all new footage of the best last minute try saving tackles and the biggest rib breaking hits, all mashed into one video that lives up to the reputation of it's predecessors with incidents from all over the rugby world. And if this doesn't satisfy you, sit tight, because this is just a glimpse of what we have to offer you. Try Savers & Rib Breakers 10 is already in production and will comprise mainly of the hardest hitting action from the Heineken Cup, Super 14, Magners League, Guinness Premiership, French Top 14, and whatever else we can get our hands on. It's coming soon, so sit back and enjoy TSRB9 in the knowledge that here at Rugbydump, bringing you big hits and classic rugby footage is what we're all about. Another belter lads, good to see some Trevor Leota in there. another great video! i love the tsrb vids and am glad to hear tsrb10 is on its way, i cant wait! Where was the last clip from? And what happened, i.e. what did the ref decide? Yeah, I'd echo Bosh's question there: was that a supporter? What happened? But great work on the latest compilation - another class act. i hope the TSRB 10 be the best of the best !!! Just click on the links on here rather than looking for them on youtube. And what about Clerc's spear tackle on the Irish scrum-half ? Will it be on TSRB 10? damn at 1:43 who did matfield stop in his tracks about to score, good god! Hahaha the last one is the best. awesome! My favourite is the lauaki hand off on Ritchie... don't mess with a bulldozer go at full speed! choo choo! haha! Another fantastic vid!! Glad to see Nese Malifa's hit on the Canadian in there. Love from the United States. AMAZING CANT WAIT FOR 10TH !!! That was Bakkies Botha who stopped Jery Paul in his tracks in the tri-nations 2005 at Ellis Park. It was one of Bakkies's more memerable hits of his carreer so far. What a monster!! One of the best so far, good to see White and Leota in there. I'm thinking there are a lot of crazy tackles, if not necessarily 'rib breakers' going on in the 6 nations, would be good to see some of them. Maybe in the next tackles video or at least Ross Rennie launching Brian O'Driscoll over his head in the Scotland game. I might suggest if you're going to go for guitar music, the really heavy stuff is great for these videos, perhaps a Pendulum style Drum and Bass track? That's proper psyche-up music. great to hear that the tsrb series will be continued! i wish rugby would be more popular in Germany! Great to see Leota in one of these. Greast video. Must admit, I like the Nickelback song, although their lyrics are for teenage Canadian boys __ing off to images of Pamela Anderson and Wayne Gretzky (not necessarily in that order). I've suggested Pantera in the past, but a band that was influenced by them is a good proxy. I would enjoy a try savers and rib breakers comp to be made from hits on the English National Team! That would be something one can watch over and over again! wat was gng on in da last clip??! !lol gr8 vid keep it up!! lovely stuff, keep 'em rollin in- any chance of seein a TSRB just for the 6 nations 2008 (and the most recent Tri Nations)? when will TSRB10 be posted? got to love the around the neck tackles... great video!!! cant wait for the next one!!! Once again, a wicked video! all put a smile on my face. 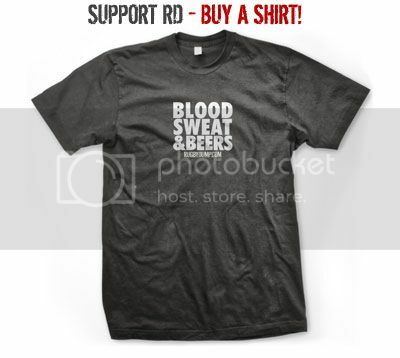 i love tsrb. always makes my day. do you rekon u could do a tsrb 6nations edition? i think it would be pretty gd. I'm still waiting for it! Great vid yet again, how about attitude by metallica for the next vid? Good one guys - quite a few there from Trev Leotas School of Hard Knocks!! that hand off by Juan Smith at 1:55 was a cracker, dunno why i like it so much since i'm welsh, but hey. what the hell is guy at 1:48 doing? hes walking into a huge hit? unbelievable..... schalk burger getting knocked backwards. i thought it was usually the other way around?!?! awesome one, best of them all. Suprised to see Burger getting boshed out of the way! !